Choose from a long list of splendid “Romantic Extras” (made-to-order candlelit meals, flower arrangements, spa treatment …) and add tickets to any of the area’s finest attractions and entertainment you like! We’ll do all the hard work for you. TIP: Valentine’s Day falls on a Thursday this year. The good news is that all through February we have our Weeknight Specials, applicable on Sunday through Thursday nights – book a 4-night stay and get it for half price! It’s our “Buy 2 Get 2 Free” and you can use it to make a week of fun and romance in the Smoky Mountains. Call us anytime at 855-91-SMOKY and see our Specials page for more details. Welcome to the romantic paradise of the Smoky Mountains, where people come to fall in love, to celebrate love, to propose marriage, to honeymoon, and to return years later to honor their anniversaries and to renew their wedding vows, sometimes with their grinning, grown children. Welcome to the cabins, chalets and lodges nestled everywhere throughout the trees with stunning views of the Smoky Mountains, snug with fireplaces and outside snows, alive with hot tubs on the decks and heart-shaped Jacuzzis inside. Gatlinburg weddings happen in the third most popular city in the world for people to get married! And the area all around is home to numerous chapels ready for the occasion, all against the backdrop of an impossibly romantic setting made for lifetime memories. Let’s run away and get married! The State of Tennessee requires no waiting time to get a license, and with the mountains involved, Smoky Mountain weddings can be as extravagant or as simple as you choose. 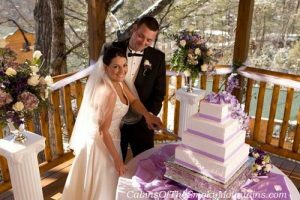 Everything you could want to make your wedding day perfect is here in the Gatlinburg and Pigeon Forge area, from the rustic and modern places that host the magic event to the numerous professionals and local townspeople who supply and service it, dress and decorate it, and record it for posterity. The cabins are the perfect home away from home to stay in during your romantic visit. 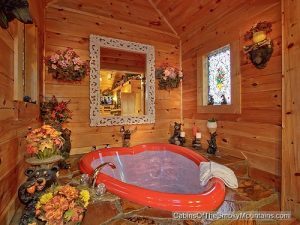 Stop by our our Gatlinburg cabin rentals, our Pigeon Forge Cabins or our Wears Valley Cabins pages to see what’s available this Valentine’s Day. Coming up with something fun, exciting, and truly romantic on Valentine’s Day can be tough. This year, forego the stuffy dinner and lavish gifts. Instead, take some time off and spend it together in one of the most gorgeous places on earth.